Mr. Shen then gave the rescuers two choices: to have the truck transported out of Jiaxin by the police, or to have 200 of the cats released to rescuers. The rescuers from the three rescues groups (Shanghai, Wuxi, Suzhou), refused to choose, and declared that they will fight to the death and not abandon even one cat. In the afternoon of Dec the 18th, the cat rescuers got a text message about the track of a catnappers’ truck, and they had themselves ready to depart at any time. At 10:00 pm, two cars with ten cat rescuers and one reporter from Beijing joined other cat rescuers from the city of Wuxi (a city close to Shanghai). At 11:20 pm, they had the catnappers truck stopped at Jiaxin city in the Zhejiang Province (not far from Shanghai) and called the local police. After midnight, at 1:00 am on Dec the 19th, they managed to get the truck down to the local police station called: ‘Wang Jiang Jing Police Station’ with the police officers’ help. There were 30 cages containing around 600 cats with 3 catnappers and 2 truck drivers. At 2:00 am, the police decided they will make a decision on what to do after when the morning shift starts. The rescuers from Shanghai and Wuxi had to stay with the truck for the whole night, where the temperature was below 0 degrees and frost was on the ground. At 9:00 am, the rescuers were all there waiting for the police to make their decision about the catnappers. During the wait rescuers discovered that some cats had died in the cage over night. Two catnappers went inside the police station and after a short while they emerged and announced their decision. The police officers saw that the catnappers have a certificate of quarantine, and legal paperwork. Rescuers tried explaining to the police that the certificates were fake, but the police maintained that if the rescuers couldn’t prove that the certificates were fake, then the truck will be released to the catnappers. At 10 am, the rescuers, being upset about the police officers’ unfair attitude, had posters made saying “Down Catnappers! Return Our Cats!” These were hung on their cars. Mr. Xu Yixiang, the vice director of the Wang Jiang Jing Police Station, said that the citizens’ property is under protection, so the cat-nappers are protected under the law because the cats belong to them. Other police officers rudely asked the cat rescuers if they had any other jobs to do other than play with cats. At 12:30 pm, Suzhou rescuers came to support the other rescuers, and five rescuers’ cars blocked the access for the truck to leave. At 1:00 pm, the police officers, under pressure, agreed to negotiate with the rescuers. Three representatives from Shanghai, Wuxi and Suzhou went into Director Shen’s office to discuss the problem. At the same time, one rescuer was sent to Zhen Jiang (also near Shanghai) to report the situation and to find a way to prove that the catnappers’ certificate was fake. 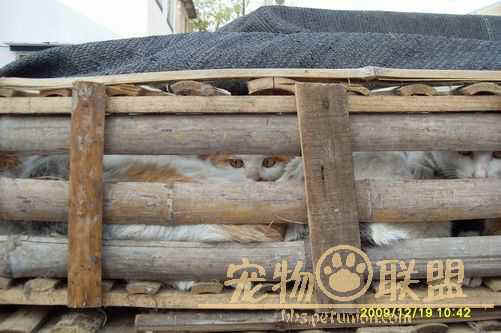 Mr. Shen demanded that the rescuers prove the certificate of quarantine fake by 3:00 pm, or the truck will be released to the catnappers. At 2:00 pm, after several ways of trying to show that the certificate was fake failed, the rescuers had to give up the negotiation with Mr. Shen. Mr. Shen then gave the rescuers two choices: to have the truck transported out of Jiaxin by the police, or to have 200 of the cats released to rescuers. The rescuers from the three rescues groups (Shanghai, Wuxi, Suzhou), refused to choose, and declared that they will fight to the death and not abandon even one cat. To prepare for the worst situation, the rescuers called for more help, and split the rescuers, with some going to the access of the Jiaxin highway and with some staying at the police station. At 4:00 pm, more police arrived. There were more than ten police officers that arrived that were specialized and fully armed. The rescuers were in a bad situation, but some still went and lay underneath the catnappers’ truck to prevent it from moving. At 4:30 pm, at Mr. Shen’s order, the police surrounded the rescuers and the truck and dragged the rescuers out from under the truck one by one. When the access was all clear, the cat-nappers returned to their truck and left towards the highway. At 5:00 pm, Mr. Shen said that the rescuers will be allowed to leave half an hour after the truck had left. However, he soon changed his mind, and asked for all the rescuers to show their IDs so that they can be recorded for the investigation, which resulted in the rescuers staying there even longer. 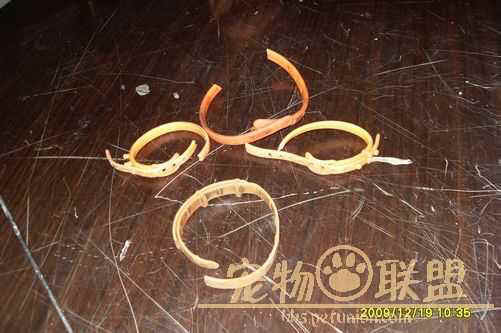 Mr. Shen even had two of the front rescuers arrested for affecting their official business. After all of this, the rescuers could finally leave to join the rescue over the highway. At 6:30 pm, all the rescuers joined ASAP to contact the two cars that were waiting over at the highway access, and knowing that the truck was stopped successfully at the toll pay highway station, they called the police in the Jiangsu Province. At 7:00 pm, the rescuers went to the Wu Jiang Police Station in the Jiangsu province, and called the Jiangsu Agriculture Bureau in hopes that the police officers there will release the cats. At the same time, more rescuers from Shanghai arrived, and the local police officers showed mercy to the rescuers and had the truck transported to the police station. AAt 7:30 pm, after negotiations with the rescuers and the cat-nappers, the cat-nappers were forced to have all 600 cats released to rescuers. We won! 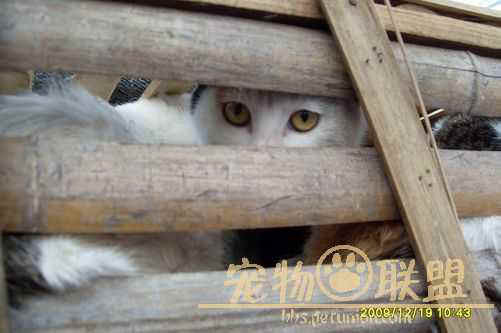 The rescuers had an urgent meeting, and decided that the 600 cats will be released to the Wuxi Cat Rescuer Group. Rescuers prepare to take the cats to a sanctuary. At around 1:00 of Dec the 20th, 30 cages containing the rescued cats were safely back in Wuxi, and the cats were released to chosen living areas in Wuxi. 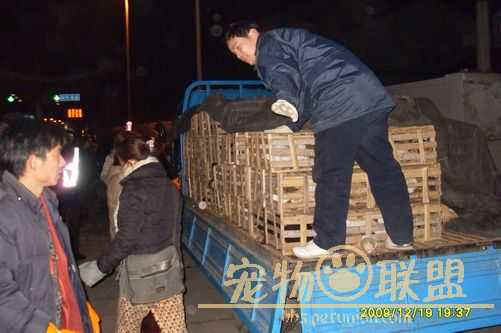 At 4:00am, the Shanghai cat rescuers finally returned to Shanghai for a well deserved rest.